The Cliff House Strangler by Shirley Tallman is the third book of the Sarah Woolson mystery series set in turn-of-the-20th-century San Francisco. Sarah Woolson is a plucky young woman attorney, an unexpected profession for a woman of high society. Most of her family deplores her career and her decision to start her own business, but she is determined to succeed. Sarah's brother Samuel is the exception to her family's disapproval. He's secretly a newspaper reporter, which would also dismay their conservative family, if they knew. On a night Samuel is over-committed to chasing potential newsworthy events, Sarah agrees to cover a seance at the Cliff House. Madame Karpova emigrated with her brother from Russia, and has become quite a sensation with her predictions and visitations. Samuel hopes Sarah will discover tricks and gadgets used during the seance, to uncover them as frauds, a possible coup for the newspaper. Robert, Sarah's former colleague at a prestigious law firm, agrees to attend the seance with Sarah. He's a reluctant supporter of her feisty energy and drive to succeed, but usually prefers she behave traditionally. He's also reluctant to admit his attraction to Sarah (of which she's unaware). A fierce storm makes their trip to the Cliff House (by horse and carriage) challenging and dangerous, and provides a dramatic background for the seance. A sensationalist newspaper reporter makes an unwanted, unexpected appearance at the seance. Most of the attendees' identities surprise Sarah. All have reputations to lose if the much-hated reporter reports they were there. Which makes for plenty of suspects when he's murdered during the seance. The police make the easy arrest - Karpova's brother. To them, he's a foreigner, of no social or political consequence; the other seance attendees are locals, many socially prominent. Madame Karpova requests Sarah represent her brother. Needing clients for her business, and having her own doubts as to his guilt, Sarah cannot refuse. She knows the police will not look any further for the real killer, with a convenient suspect in jail. Sarah also has agreed to a nearly impossible case: a woman who escaped her husband's abuse, wants a divorce, and custody of their young sons. In San Francisco society, a wealthy husband always won in any case of this kind. He after all could afford the best schools for the boys. Sarah's sense of justice compels her to fight for the boys' best chance of happiness, with their mother. Sarah persists in her investigations of both cases, against great odds. A tremendous breakthrough in evidence, at the last minute, links the cases and achieves justice. 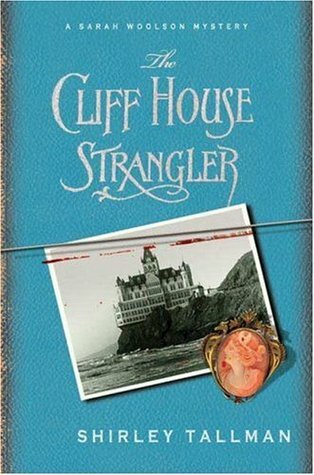 Sign into Goodreads to see if any of your friends have read The Cliff House Strangler.